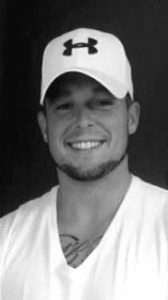 Jonathon “Tom Hamilton” Eggleston, 24, of Charlotte, passed away, Thursday, September 20, 2018, as a result of an automobile accident. He was born February 17, 1994, in Charlotte, the son of Nicole Eggleston and Paul M. Hamilton. Tom was a fun-loving kid who had a passion for farming. He could often be found tinkering around the farm when he had any spare time. Tom worked at Eaton County Farm Bureau and enjoyed being able to spend time with the other farmers he worked with. Tom is survived by his father, Paul Martin Hamilton of Charlotte; mother, Nicole Hatcher of Ohio; aunts, Janet (Dennis) Croft of Charlotte, Brenda (Larry) Hall of Charlotte; uncle, John Hamilton of Charlotte; grandmother, Silvia Hamilton of Charlotte; and several cousins and friends. He was preceded in death by his grandfather, David J. Hamilton. Funeral services were held on Tuesday, September 25, 2018, at Burkhead-Green-Kilgo Funeral Home, with Pastor David Keller officiating. Interment followed at West Carmel Cemetery. Those desiring, may make contributions in Tom’s memory to the family to assist with expenses. To view Tom’s obituary online or to leave a condolence for the family please visit burkhead-greenfuneralhome.com. Barbara “Fred” Williams passed away peacefully, late Friday, September 21, 2018 at the age of 84. Barbara was born December 9, 1933 to Charles and Mildred Allen of Lansing. She married her high school sweetheart, Earl L. Williams in 1951. She was known for her gentle demeanor and her love for bowling and all things donkey. Barbara was preceded in death by four brothers, one sister, and her husband. Barbara is survived by her brother, Gene (Carol) Allen; five children, Daniel (Karen), Raymond (Dona), Marcia (Greg) Poxson, Phyllis (Joseph) Stott, and Merle Ann (Ed) Besonen; Also 14 grandchildren, 29 great-grandchildren, and 2 great great-grandchildren. A memorial service will be held on Sunday, September 30, 2018 at Peace Lutheran Church, located at 830 N. Cochran in Charlotte. Visitation and luncheon takes place at 2 p.m., with memorial remarks at 3 p.m. In lieu of flowers, donations can be made in her name to Eaton Community Palliative Care. 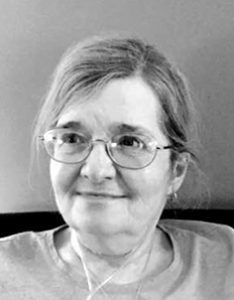 Debbie L. (Wilcox) Sudrovech of Beaufort, S.C., formerly of Charlotte, went home to be with her Savior on September 23, 2018 at 11:14 a.m. after a brief battle with cancer. She was surrounded by her children, Jennifer Hasbrook, Mike (Erin) Sudrovech, Kerrin(Scott) Hetland, and Robyn (Scott) Robinett. She leaves behind her grandchildren, Kelsey (Neil) Koontz, Jacob Hasbrook, Isaac Shrum, Aubrey Hetland, Jackson Hetland, Payton Robinett, Brody Sudrovech, Ellia Robinett, Crosby Hetland and Avenne Sudrovech. She is also survived by her mother, Marianne Wilcox and siblings, Bob (Lisa) Wilcox, Diane (Dan) Eichorst, Rick (Linda) Wilcox, Lori (Frank) DeMike, Kevin (Tammy) Wilcox and Ken Wilcox. Although our loss is great, the joy of the reunion in Heaven with her dad, Robert Wilcox and her sister, Denise, grandparents and many other dear family members and friends who preceded her in death, gives comfort that can’t be explained. Debbie would love if you could spread joy in the world by volunteering or performing an act of kindness in your community. In lieu of flowers, please consider making a donation to Port Royal United Methodist Church, 1602 State Rd. S-7-63, Port Royal, SC 29935. Kay Francis Ramsey, 80, of Vermontville, loving wife, mother, grandmother, and great-grandmother, took her final trip in life to join her Lord in Heaven on September 13, 2018. Kay was born March 16, 1938 in Decatur, Ala. to William and Elizabeth Long. Knitting and sewing quilts for her family was a great talent she had. Kay was also a wonderful baker making beautiful wedding cakes. Kay received a letter from Governor Wallace’s wife when they lived in Alabama, congratulating her on making such beautiful creations with her cakes. Socializing was important to Kay, and she loved to take her canned goods on social visits to share with her friends. Her family also recalls that she was an avid Spartan basketball fan. Kay and her husband traveled extensively, and were very proud of the fact that they had visited all 50 states. Kay retired from the State of Michigan Management and Budget, Vehicle and Travel Services, where she received special recognition from the Governor for her work above and beyond her regular duties. She loved to go antiquing, collect dolls, and shower her family with love and treats (especially at Christmas). Kay is survived by her husband, Ronald; children, Teresa Hall, Gary Smith, and Cindy Dietz; step-children David Ramsey, and Carla Ramsey; siblings, Frank Long, Mike Long, and Sandra McCarthy; as well as nine grandchildren, and nine great-grandchildren. She was predeceased by her step-son, Steven Ramsey; brother, Jimmy Long; and sisters, Carolyn Cagle, and Linda Gosline. Funeral services were held Tuesday, September 18, 2018 at Pray Funeral Home in Charlotte, with Pastor Joe Benedict officiating. If desired, the family suggests memorial contributions to The American Cancer Society. Friends and family are encouraged to share memories of Kay on her Tribute Page at PrayFuneral.com. Liam Michael O’Connor, 27, of Charlotte, a loving father and son, passed unexpectedly on September 15, 2018. Liam was born on May 8, 1991 to Michele and Gerard O’Connor. Liam had an unwavering love for his family, especially his children. He spent time walking with his children, going to the beach and watching his favorite movies. Liam especially enjoyed creating ‘haunts’ for fun on Halloween. Liam was an avid fan of the New England Patriots and the Boston Red Sox teams. Most recently, Liam worked for Kamps Palletts to help support his family. Liam is survived by his parents, Michele and Mark Montgomery; his fiancé and high school sweetheart, Emily Hosek; his sons, Mason, Keegan, and his daughter, Ensley; brothers, Travis Craun and Austin Montgomery; step-sister, Lauren Pierce; grandparents, James (Susan) Craun of Olivet, Gene (Phillis) Montgomery of Charlotte, and John (Pauline) O’Connor of Easton, Mass. Liam is predeceased by his father, Gerard O’Connor; cousin, Katie McDonough; and grandmother, Joy Hicks. The family held visitation Friday, September 21, 2018, from 10 a.m. to noon at Pray Funeral Home in Charlotte, followed by the funeral service at noon, with Pastor Mark Booth officiating. Memorial donations can be made to the American Red Cross in Liam’s name or a Scholarship fund for Liam’s children, c/o Michele Montgomery. The family would like to encourage others to learn more about addiction resources at the Eaton County Chapter of the Families Against Narcotics. Family and friends are encouraged to share remembrances and condolences online in Liam’s Tribute Page at prayfuneral.com. 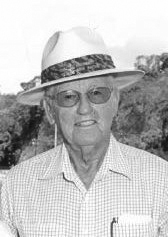 William “Bill” Hathcox, 91, of Peoria, Ariz., passed away on September 17, 2018. He was born in Pocahontas, Tenn. on March 8, 1927. Bill married Wanona Dillon on September 11, 1949 and together they had a beautiful life and family. 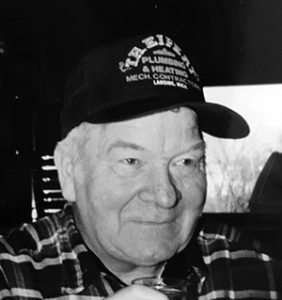 Bill had a career in truck driving for Howard Sobers Transport and was a member of V.F.W., and Teamsters Union. He had a passion for golf, travel, fishing and auto sales. He is survived by his wife, Wanona; son, Daniel Steven Hathcox; son, Michael James Hathcox; grandchildren, Katie Coster, Kyle Hathcox and Daniele Hathcox. He also leaves behind his great-granddaughter, Thunder Coster and many dear friends. Bill is preceded in death by his parents, George and Tennie Hathcox, and his two brothers, James and George Hathcox. He will be greatly missed but forever in our hearts. Visitation will be held Tuesday, September 25, 2018 from 10 to 11 a.m. followed by a funeral at 11 a.m. at Chapel of the Chimes Mortuary. Graveside service will be held at 1 p.m. at National Memorial Cemetery of Arizona. For more information or to leave a tribute please visit chapelofthechimesmortuary.com. Robert Allair Rasmussen, an avid fisherman and hunter began his new journey of fishing and hunting in heaven on Sunday, September 9, 2018. 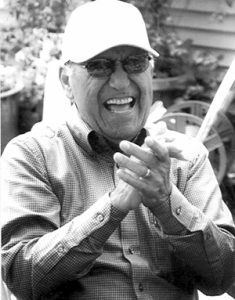 Robert, 83, was born on March 13, 1935 in Alpena, to Iner and Eleanor (Moore) Rasmussen. He worked 50-plus years as a heating and cooling installer. Robert married his sweetheart, Emily Kautz, on November 25, 1955 and spent the next 55 years creating their legacy before her passing in 2011. Robert was an active member of the Charlotte Eagles # 3552 and Moose Lodge #2565. He also enjoyed traveling around the country with his wife. Robert is survived by his children, Deborah (Bill) Bryan, Robert (Shelly) Rasmussen, and Patti Cahoo; 14 grandchildren; and 18 great-grandchildren; siblings, Judy (Bob) Slater, Bill (Carol) Rasmussen, and Mike (Anne) Rasmussen. Robert was predeceased by his wife, Emily; sons, Bruce Rasmussen and Bradley Rasmussen; grandsons, Mark Rasmussen, Shaun Rasmussen and Ethan Hoover. A memorial service was held Thursday, September 20, 2018 at Pray Funeral Home, with Pastor Charles Jenson officiating. If desired, the family suggests memorial contributions to The Fraternal Orders of Eagles #3552. 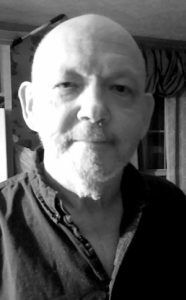 Lonny Gardner Mascho, 65, of Olivet, passed away Thursday, September 13, 2018, at his home. He was born November 28, 1952, in Edmore, the son of LeRoy and Shirley (Gilbert) Mascho. He grew up in McBride and graduated from Edmore High School in 1970. Following his graduation, he moved to Detroit to attend the Detroit Barber College. Lonny was a talented barber and enjoyed the many friends he made cutting hair throughout the years. 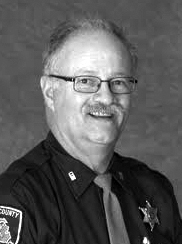 He also worked as a Quartermaster for the Eaton County Sheriff’s Department for 25 years, retiring in 2014. He was a devoted husband, father, and grandfather. 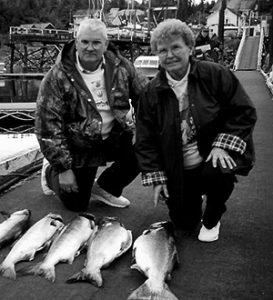 Lonny enjoyed fishing, dirt track racing, bowling, golfing, and cooking. Lonny was a passionate Detroit Sports fan and UofM fan. He stuck with them through thick and thin. He proudly served his country in the US Navy and was a life member of the Charlotte VFW Post 2406. Lonny is survived by his wife, Ellen; daughters, Lindsay Mascho of Charlotte, Chelsey (Benjamin) Cook of Lake Odessa; step-sons, Tim (Mary) Cortright of Olivet, Jordan (Angie Stinson) Cortright of Olivet; grandchildren, Kaley, Madelyn, Tessa, Drew, Chloe, and Christopher Cortright; mother, Shirley Mascho of Edmore; siblings, Larry (Char) Mascho of Saranac, Sherry (Mitch) Snyder of Stanton, Shelly (Mike) Bailey of Stanton; mother-in-law, Jannette Hayes of Eaton Rapids; brother-in-law, Steve (Mary Ann) Hayes of Charlotte; and numerous nieces and nephews. Funeral services were held Tuesday, September 18, 2018 at Burkhead-Green-Kilgo Funeral Home, with Pastor Charles Jenson officiating. Those desiring may make contributions in Lonny’s memory to the American Diabetes Association or Gift of Life. To view Lonny’s obituary online or to leave a condolence for the family please visit burkhead-greenfuneralhome.com. Vernie Lee “Pops” Miller of Eaton Rapids passed away September 15, 2018 at the age of 72. Vern was born in Parma, on June 25, 1946, the son of Wardie and Mallie (Bailey) Miller. He worked at Michigan Packaging for 41 years before retiring in 2010. Vern coached the Wild Bunch softball team for 31 years, enjoyed drag racing in Onondaga, playing golf, being outdoors, hunting, grilling and burning the food and spending time with his family. He is survived by his wife of 52 years, Laura Miller; sons, Denny and David Miller, both of Eaton Rapids; grandchildren, Tracie (Zach) Miller, Marcus (Ashleigh) Miller, Keisha (Jamie) Bryant, Chris (Kaitlyn) Miller, Hailie Miller, Allyza Miller, Isaac Miller; great-grandchildren, Nevah, Gaige, Kaydence and Kameron Miller, Alexis and Jamie Jr. Bryant, Aspen, Logan and Prestyn Miller; brothers, Stanley (Lonie) Miller of Kentucky, Alma (Tommy) Kee of South Carolina, Ken Miller of DeWitt, Larry (Kathy) Miller of Springport; and daughter-in-law, Missy Miller of Eaton Rapids. Vern was preceded in death by his son, Michael Miller; and sisters, Elsie Johnson, and Zelma Norment. Funeral services were held at 11 a.m. on Friday September 21, 2018 at Mills Funeral Home, Shelly-Odell Chapel in Eaton Rapids. Those desiring may make memorial contributions to the family to help with funeral expenses. Please visit millsfuneral.com to place online condolences or to sign the guest book. Ruben Gracia Chavez, 89, a devoted Christian and family man, went to meet his Lord and Savior. Ruben’s sunrise was August 22, 1929 in Corpus Christi, Texas to Jesus and Guadalupe (Gracia) Chavez, and his sunset was September 17, 2018 in Potterville. A man of knowledge, peaceful calm, and quiet faith, family was everything to Ruben. He greatly enjoyed trips when he and his wife, Lucinda, would pack all of the kids in the station wagon and head to Texas to visit family. For a time, he ran his parents’ store, Chavez Grocery, and he later worked for Oldsmobile, retiring in 1987. Ruben enjoyed Spanish music, flea markets, word searches, and puzzles, but spoiling his grandkids with gum, spare change, ice cream, and cookies filled his heart with the greatest happiness. Ruben loved his wife deeply, and it showed through the love he had for his family. Ruben is survived by his wife of 68 years, Lucinda Martinez (Lozano) Chavez; eight children, Ruben L. Chavez Sr., Guadalupe Hoag, Sylvia (Ray) Jolly, David (Yvonne) Chavez, Armando Chavez, MaryHelen (Terry) Wheeler, Catalina Jones, and Manuel (Meg) Chavez; 24 grandchildren; 29 great-grandchildren; siblings, Joe Chavez, Ramiro Chavez, Lucy Jalifi, Rosalinda Peña, special sister-in-law, Lucy Rendon; and many nieces and nephews. Ruben was predeceased by his parents; son, Carlos “Danny” and son-in-law, Don Hoag; and siblings, Adolfo Chavez, Gloria Gutierrez, Jesus Chavez Jr., and Alonzo Chavez. Graveside services were held Friday, September 21, at 2 p.m. at Benton Township Cemetery. If desired, the family suggests memorial contributions to St. Mary Catholic Church in Charlotte. Friends and family are encouraged to share memories of Ruben on his tribute page at PrayFuneral.com.